On Monday, Sept. 27, the Pennsylvania Public Interest Research Group (PennPIRG), Temple Student Government representatives and congress members met in the Student Center atrium to discuss changes to the health care system that affect college students. “As of Thursday, America got a whole lot better for about 32,000 students,” TSG Senate President Colin Saltry said at the press conference. The meeting came after PennPIRG released a guide explaining options for young people under the new health care laws, parts of which went into effect late last week. As of Sept. 23, people can be covered by their parents’ health care plan until they are 26 years old, and insurers cannot drop coverage due to paperwork errors. “Under the old system, the same insurance that you had for years would suddenly cost way more because you were one day older or one day out of college. Now, young people have the option to stay on their parents’ plan and keep the same rates,” PennPIRG State Director Megan DeSmedt said. Rep. Chaka Fattah of Pennsylvania’s 2nd Congressional District, along with Majority Whip James Clyburn of South Carolina’s 6th Congressional District, spoke at the event. “This bill will double the number of community health care centers in this country,” Clyburn said, emphasizing the need for preventative care in health care plans. Clyburn added that the bill will allow community health care centers to work with hospitals. “This is so much of what will get young people out of emergency rooms,” he said. Clyburn also discussed changes to the student-loan system that were included in the health care reform. “When we passed this bill, we also passed significant reforms in education,” Clyburn said, referencing changes to the Pell Grant. The remaining changes – which include banning pre-existing condition denials, illegalizing gender discrimination in insurance and making coverage more affordable – are set to go into effect Jan. 1, 2014. 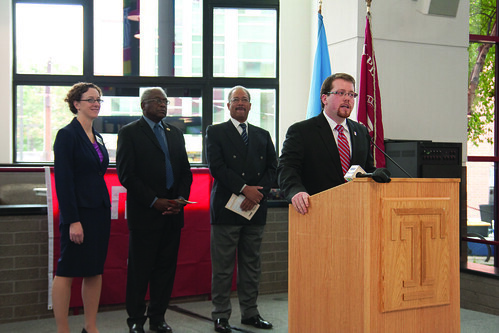 Saltry reiterated the importance of the newly implemented changes, especially for Temple students, highlighting the changes specific to college students and the increasing availability of preventative care. i never commented before but i just had to now. good site.